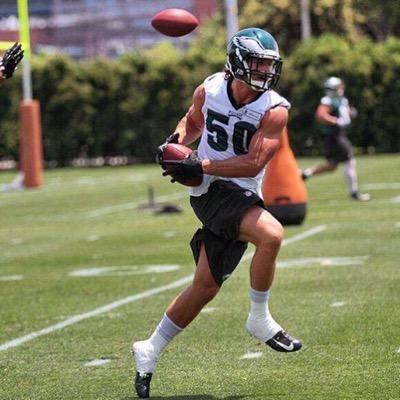 Philadelphia, PA – Mystery is still surrounding the injury status of Eagles inside linebacker Kiko Alonso, who has yet to be officially ruled out of Sunday’s game against the Washington Redskins despite undergoing an emergency amputation of his injured leg. While having his knee scoped by Dr. James Andrews, the esteemed doctor detected massive amounts of necrosis and infection in his injured left knee and had to order an immediate amputation of the linebackers leg just above his banged up keen. “Well, we’re going to see with Kiko. He may be able to rehab the injury, he may have to get additional surgery. We’re just not sure where he is right now,” Chip Kelly said before Thursday’s practice. Les Bowen, however, had a much different opinion on the injury. “Alonso had his leg amputated, he’ll have to undergo years of therapy to even walk again. What is wrong with everyone?” he tweeted. Despite the news, Kelly remained upbeat about his linebackers availability.